Switch easily between trailers with this adjustable, aluminum ball mount. Go from a 4" drop to a 5" rise. Tow up to 8,000 lbs with the 2" ball and up to 10,000 lbs with the 2-5/16" ball. Solid-Tow system prevents rattling. 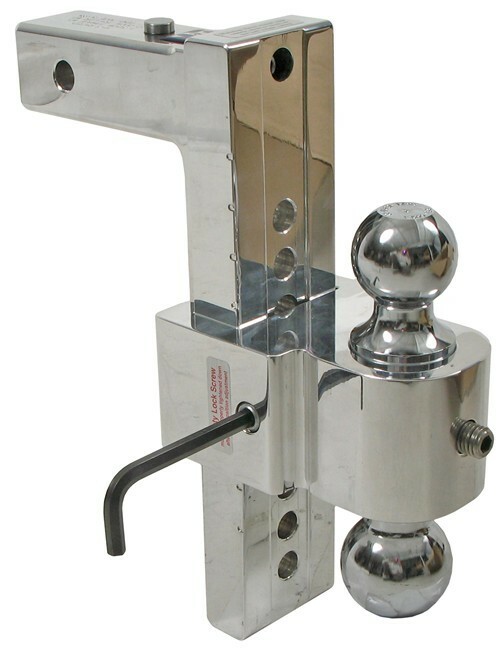 Call 800-298-8924 to order Fastway ball mounts part number DTSTBM6400 or order online at etrailer.com. Free expert support on all Fastway products. Guaranteed Lowest Price and Fastest Shipping for Solid-Tow Adjustable 2-Ball Mount w Chrome Balls - 2" Hitch - 4" Drop, 5" Rise. Ball Mounts reviews from real customers. 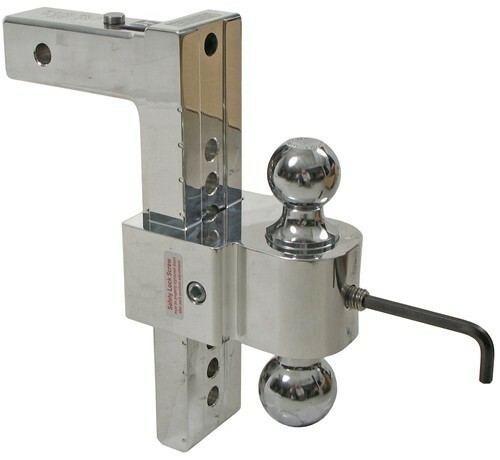 Switch easily between trailers with this adjustable, aluminum ball mount. Go from a 4" drop to a 5" rise. Tow up to 8,000 lbs with the 2" ball and up to 10,000 lbs with the 2-5/16" ball. Solid-Tow system prevents rattling. 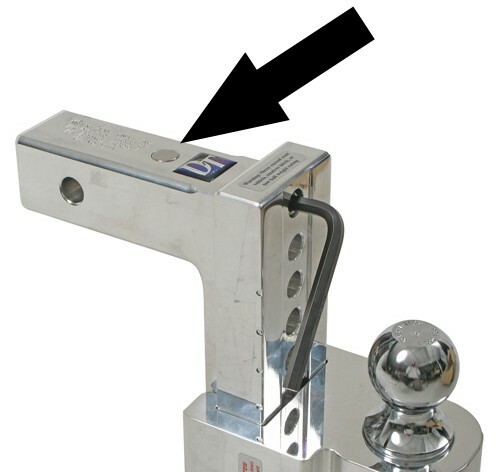 Distance from center of hitch pin hole to back of upright bar: 4-1/4"
Distance from center of hitch pin hole to center of ball: 8-1/2"
This Fastway Solid Tow adjustable ball mount provides solid, rattle-free towing performance. A stainless steel pin, operated by the included hex tool, extends out from the shank and tightens the ball mount in your receiver. To further eliminate any movement, a bolt in the side of the ball platform tightens the connection between the platform and the adjustment shank. As a result, you'll enjoy a quiet, rattle-free towing experience. The ball platform is connected to the adjustment shank by the hex bolt located in the front of the platform. To change the ball height, simply loosen both the bolt in the front and the bolt in the side of the platform with the included tool. This will release the ball platform and allow you to slide it up and down. Or, you can slide the platform off and reverse it to change the ball size. This all-steel, adjustable ball mount lets you tow up to 10,000 lbs with the convenience of a 4" drop or 4" rise. Includes 2" and 2-5/16" steel hitch balls, and fits 2" trailer hitches. 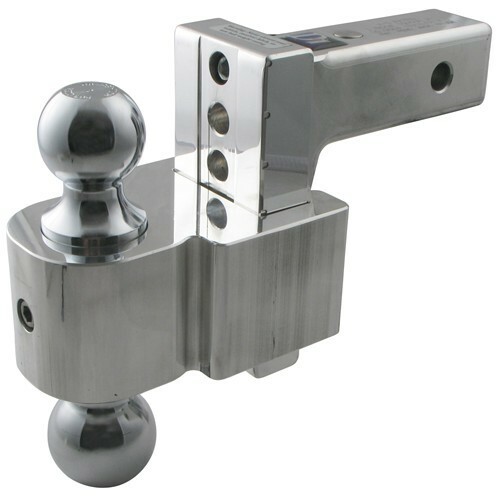 Switch easily between trailers with this adjustable, aluminum ball mount. Go from a 6" drop to a 7" rise. Tow up to 2,000 lbs with the 1-7/8" ball and up to 8,000 lbs with the 2" ball. Solid-Tow system prevents rattling. 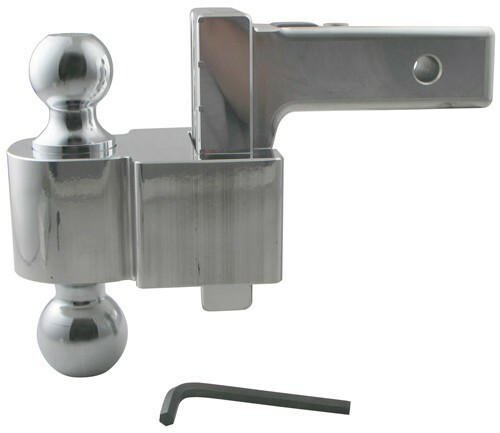 Replacement Chrome Double Ball for Fastway and Diversi-Tech Ball Mounts - 1-7/8" and 2"
Order: RelevanceNewestRating - High to LowRating - Low to High Switch easily between trailers with this adjustable, aluminum ball mount. Go from a 4" drop to a 5" rise. Tow up to 8,000 lbs with the 2" ball and up to 10,000 lbs with the 2-5/16" ball. Solid-Tow system prevents rattling. So far so good. Its been really good and Im glad I got this particular one. After one year, Im still impressed with this hitch. Works great and very impressed with the quality. Excellent unit.... with one exception. The removable dual ball section of the unit has rusted terribly. This piece should have been STAINLESS STEEL. The original unit is chrome plated steel. I am very disappointed with that thing rusting like it has in such a short time. I see that they offer a stainless steel replacement for $100. Too bad this option is not offered at purchase with a small upcharge. I have wanted to contact the manufacturer for replacement.... but I do not want to go through the hassle. Is the shaft on this model a true 2.5 inch shaft without an adapter sleeve. The photographs above have no shaft but I am not sure if it was simply removed for the photographs or if this is a true 2.5 inch shaft. If it is a true 2.5 inch shaft then the anti-rattle pin will work much better than on a model where it also has to compensate for the sleeve. The 2-1/2 inch versions of the DTSTBM line do use an adapter sleeve. They use an extended length anti-rattle pin that passes through the adapter to make contact with the receiver just like the 2 inch counterparts. Check the link to the photo, its the shorter 4 inch drop version of this hitch. I love that ball mount, so much so that I found a second one listed on VT Craigslist with a 2 & 1-7/8 combo ball mount. The Diversi-Tech units really do absolutely stop the trailer from bouncing in any way. They are so simple to adjust for my various trailers that I carry nothing else in the truck. 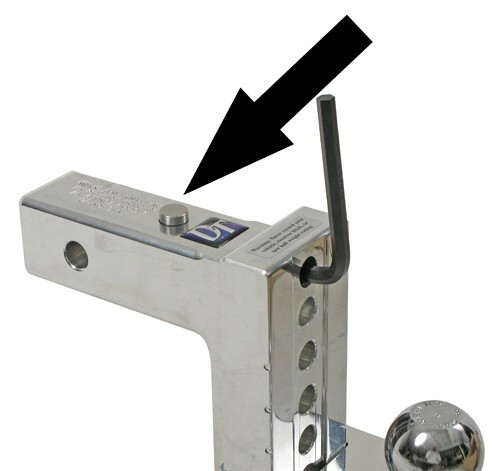 The most popular ball mount for the Curt Hitch # 14055 is the Forged Ball Mount # 40330 which has a distance of 8-1/2 inches from the center of the hitch pin hole to the center of the ball hole. 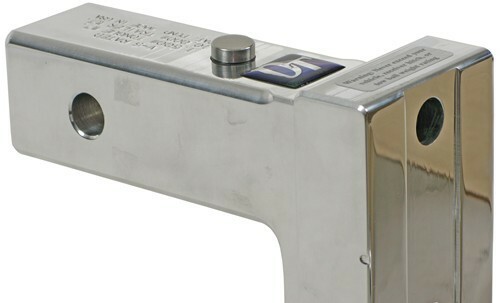 While the Diversi-Tech Adjustable Ball Mount # DTSTBM6400 has the same distance of 8-1/2 inches. Based on that you should have no problem using a # DTSTBM6400.